There comes a time when we're forced to choose between conflicting responsibilities or to make ethical compromises for good reasons. How do we decide what is right, and more importantly, what is right for us in our unique situation? 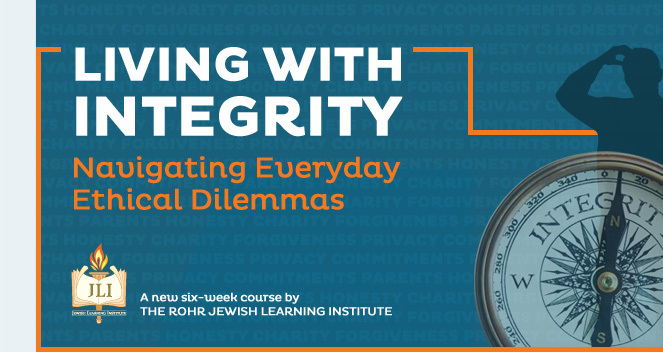 Packed with real-life scenarios, Living with Integrity challenges you to voice your opinion while providing practical Talmudic wisdom to help you navigate skillfully through life's inevitable ethical challenges. This course will not only provide you with tools to make the right decisions, but it will also enhance your interaction with family and friends. Even with the highest ideals and best intentions, we don't always know the right thing to say or do. Living with integrity is never easy. We all try the best we can. But every one of us faces dilemmas day in and day out that challenge our sense of right and wrong. Should you forgive domestic violence? Is it correct to forgive the one who harmed you when you cannot do so with sincerity? Should you forgive if the offender refuses to admit doing anything wrong? What about when the person you harmed is no longer alive: Is forgiveness still possible then? When faced with a choice to save the whales, feed the starving in Africa, or give to your local synagogue, where should your charitable priorities lie? Do taxes, tuition, and community dues count as charity? Should you give to a beggar when he may use your donation to buy drugs or alcohol? When your children and parents both need care, where do your responsibilities lie? What are your responsibilities to your in-laws? What is the extent of your financial obligation to your parents? When there are multiple siblings, how should the filial responsibility be delegated? Should you lie to avoid hurting your parents' feelings, protect your kids from a frightening truth, or keep a dying man from knowing his fate? How about speaking a white lie to keep a surprise party secret, or exaggerating in an interview to get a job? Where do you draw the line? Your friend is depending on your investment to get his business up and running. You agreed to help your friend move. You made a large pledge, but circumstances have since changed. Just how binding are your commitments? When is it all right to renege? of the Torah and Talmud are unique. Living with Integrity provides its students with an opportunity to think about their values and behaviors and align them with the kind of person that they want to be. Living with Integrity is a refreshing reminder in our age of relativism that there are solid answers to our various ethical dilemmas which we face in everyday life.